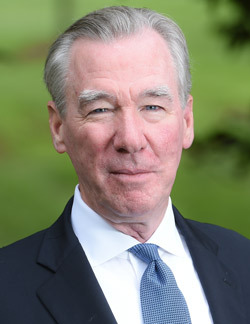 (WASHINGTON, D.C.) The Board of Trustees of The Catholic University of America announced today that it has renewed the appointment of John Garvey, University President, for a term extending through June 2022. Garvey became the 15th president of Catholic University on July 1, 2010. In June of 2017 the University completed a reorganization of its corporate form, assigning reserved powers to a group of Fellows, and principal responsibility for governance to a predominantly lay Board of Trustees. At that time the new Board began discussions about renewing the President's appointment for another term. "On behalf of the Board of Trustees, I am delighted that John Garvey has agreed to continue to serve another term as the President of Catholic University," said Joe Carlini '84, who serves as Chairman of the Board. "John has demonstrated academic leadership, commitment to core Catholic values, and significant investment in the student experience during his time here. The trustees are looking forward to joining him in transforming the campus and growing philanthropic investment in our future." "As Chancellor of Catholic University, I am pleased that John Garvey will continue to serve as one of the nation's key spokespersons for Catholic higher education in the United States," added Cardinal Donald Wuerl, archbishop of Washington. "His commitment to ensuring the academic excellence and Catholic identity of this great institution of higher learning will certainly continue to sustain the effort to shape the culture and the future of the Church in our nation." The president oversees the operations of the University with the assistance of a leadership team that includes the provost, who is the chief academic officer, and vice presidents who are responsible for student affairs, enrollment management and marketing, advancement, and finance. On his reappointment Garvey said, "It is an honor to continue serving Catholic University at such an exciting time. Though higher education is experiencing significant changes, I am confident that the University's leadership will continue to build upon our strengths and grow investment in our University, not only for this present moment but for our future."